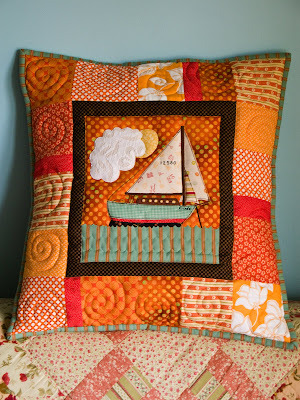 I made this pillow as a Christmas present for Claire's bigger 10-year-old best friend who loves sailing and the colour orange. 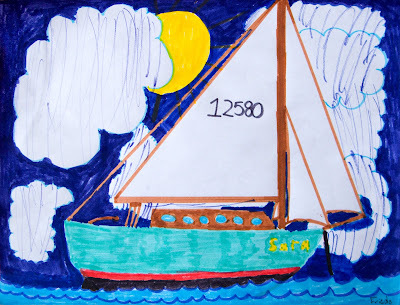 I secretly planned this present a couple months in advance, mysteriously giving her a project to draw a sailboat picture for me. Weeks went by and she was very curious! She kept asking me what I was planning to do with her drawing, and I would reply in a taunting voice, "Yoooou'll seeeeee!" I scanned her drawing into my computer and turned it into a black & white photocopy which I then printed out. I used it for the template and cut all the shapes out drawing the reverse on the paper side of fusible webbing adding extra where the pieces would be overlapped by another piece. Then I ironed it onto the back of the corresponding fabric and cut out the shapes. Peeled the paper backing off, positioned the pieces, and ironed them onto the background block. Beacause the fabric edges were raw, I sewed around each shape twice to prevent any unravelling after many washes. 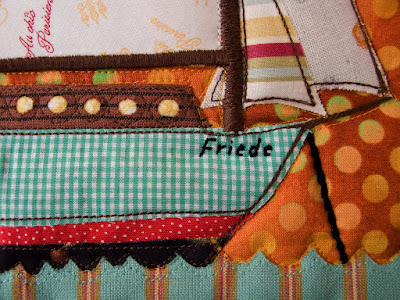 Here is her fabulous sailboat drawing :o) And she absolutely LOVES her new pillow! i love it! also you should totally do more scarve pattern! Lovely! Love the unusual colors you chose and the "windy" swirls all around the border! She will adore this! What a beautiful pillow just lovely! Well done! What a creative mind you have and what a lovely gift. The artist who drew the picture is pretty smart too. Kind regards, Anita. This is SO fantastic! I love it!!! beautiful work! you are enchantress! OH Wow that's amazing, I am sure it will be a treasured posession for ever. And what a fantastic drawing for a 10yo. I am still hoping that you will be able to release some more of your patterns (teacup purse...) without me having to buy the book. I will keep reading until and after that happens as your blog is beautiful. Very, very nice to see it, I like your blog so much. What a wonderful Pillow for the young girl. I´m sure she will love her own design on it. The name you gave the boat is the german translation of the word peace. Fantastic pillow! You are amazing! Great idea! very warm and cozy. 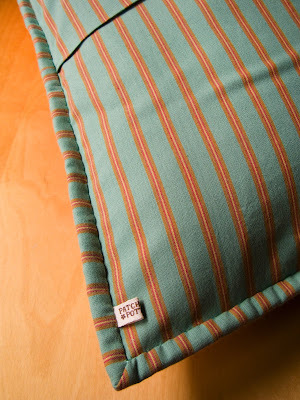 I really love the colours that you picked to do this pillow. Very nicely done! Your pillow is beauttiful! I love it too! It is so lovely! I like especially the quilting. Perfect for a girl and a boy. beautiful pillow! You are so clever getting her to do the design up for you! Gorgeous, perfect work as always!!! I am full of admiration for how you take an idea through to completion so deligthfully! It's so nice! And it's so positiv! Wow! What a fantastical and adorable pillow! 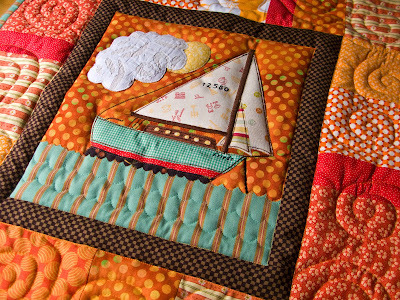 Love your sailboat idea...and I think we could develop around many more on similar lines.Intricate and detailed work. Its just beautiful work from you. Добрый вечер!Читаю ваш журнал и восхищаюсь всеми работами!Красиво и гармонично!Спасибо за красоту!С уважением Ирина. I did'nt get to way to become a fan of your blog or to suscribe to receive any new post. Can you tell me how? I like your works really much! And I would like to know if you could indicate me good books to start learning patchwork and quilting because I would pretty much like to learn it! I started having sewing classes and they're teaching me the basics, although I already gave some tries. Thank you for your attention! Oh, I just loved your new work-space!